This handy 4-in-1 tool comes equipped with LED lighting, AM/FM radio access,manual charging capability, and an emergency siren. With the dynamo crank arm,neither battery nor electricity is needed! 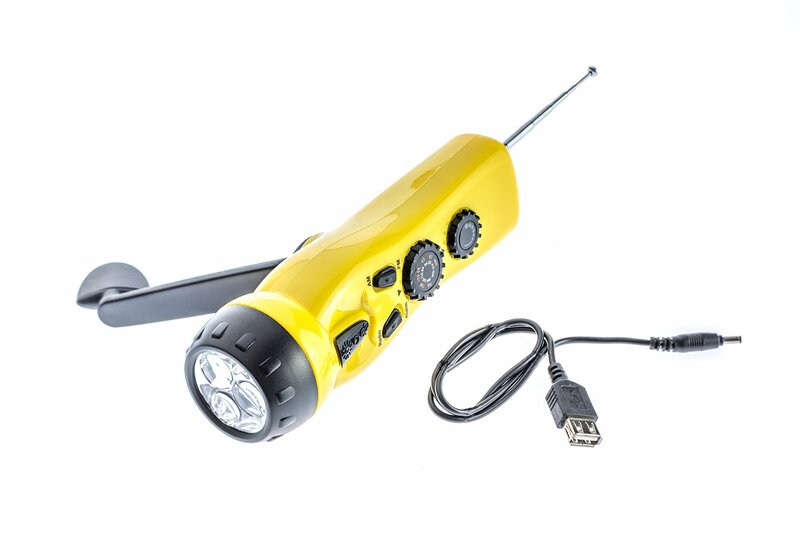 Just one minute of cranking powerwill easily charge this device for up to 30 minutes of high-beam light / 90minutes of low-beam light--a must-have for your camping, travel and emergencypreparation needs! Features of this product include: 3-LED-bulb flashlight with 2-stage switch: - High beam: (3) LEDs on full brightness (push switch forward) - Low beam: (1) LED on energy saver brightness (push switch back) AM/FM radio band switch: - AM Band: 530 - 16,000 kHz - FM Band: 87 - 108 kHz - Turning dial for tuning into your preferred station Universal female USB-A & DC charging cable adaptor: - For crank charging phones, laptops, and other electronic devices - Device to be charged must be USB-A compatible Emergency alarm siren: - Radio/alarm slide switch to activate - Loud, repetitive "woo-ing" sound Dynamo charging crank: - Designed for both left- and right-handed users - 30 minutes of high-beam light per 1-minute of cranking power - 90 minutes of low-beam light per 1-minute of cranking power Telescopic antenna - Extends up to 7-" - Easy-to-adjust angling for best signal strength Volume dial for radio 3.5mm Headphone jack Using the Dynamo Crank: 1) Flip out the crank. 2) Hold the body firmly while rotating the crank clockwise. Important: Avoid getting counterfeit items. Genuine SE products come with our SE logo onthe packaging. SE is committed to providing the customer with the best possible source forvalue. You will enjoy the quality, function and usefulness our 4-in-1 DynamoEmergency Radio Flashlight has to offer. SE is a registered trademark protected by US Trademark Law.